What better way to shake off the Thanksgiving food coma than the annual tradition of heading to Las Vegas for AWS re:Invent; which just keeps getting significantly bigger every year! Of course Fugue will be there again this year showcasing how our customers are ensuring the security and compliance of their AWS infrastructure and automatically remediating cloud misconfiguration to prevent data breaches and system downtime events. Take a little time at AWS re:Invent to learn how you can quickly identify compliance violations in your cloud infrastructure and ensure they never happen again! Our team of solutions architects and cloud security experts are available to meet 1:1 with you and your team during the event. We are excited to explore how Fugue can help you eliminate cloud infrastructure risk while integrating policy checks with whatever CI/CD and provisioning tools you use. To schedule a 1:1 meeting, click here. Stop by the Fugue booth (#2305) to catch one of our talks on cloud security and compliance. We’ll be packing a lot of important information into each session, so get ready to completely rethink how cloud security and compliance is done. Cloud misconfiguration due to human error is pervasive and can result in a critical data breach. Phillip Merrick discusses what you need to know about cloud misconfiguration and how to prevent it. Baseline enforcement is Fugue’s unique approach to automated remediation of cloud misconfiguration. We will demonstrate how Fugue finds and remediates misconfigured cloud resources back to a known-good baseline. The Fugue Compliance Suite is a a set of pre-built, policy-as-code libraries that make it easier for enterprises to validate cloud infrastructure against security and compliance policies such as NIST 800-53, HIPAA, GDPR, and AWS CIS Benchmarks. Booth #2305 is also the place for winners! 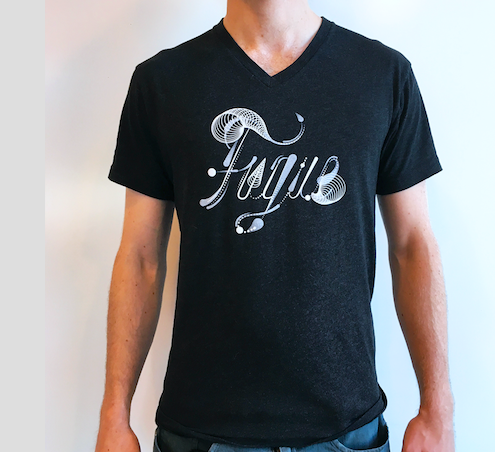 Our Fugue shirts have been such a hit, no one will let us change them! Be sure to stop by the Fugue booth (#2305) to make sure you’re not one of the few without one! Wear your Fugue t-shirt to re:Invent. Take a selfie wearing your Fugue shirt at AWS re:Invent and post it to Twitter with the hashtags #FugueRiskManager and #reinvent. That gets you entered into the drawing. Check with us on Thursday the 29th, which is when we'll draw the winner. We'll be having multiple daily drawings for a Nintendo Switch. Stop by our booth to enter. We’ll have three drawings on Tuesday, three on Wednesday and two on Thursday. Join us at the Fugue Suite at the Wynn for cocktails and hors d'oeuvres. We’ll be gathering together with some of the leading experts on cloud to discuss where security and compliance automation is headed in a fun, casual atmosphere. Register here. We look forward to seeing you at another exciting AWS re:Invent! Here’s to the best one yet!